The awareness surrounding sustainability cannot be overlooked - especially when you have some of the best and most learned professionals from different fields uniting on one platform to address it! 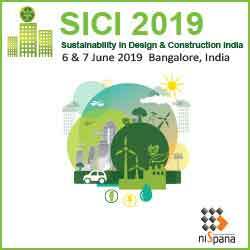 The 5th Annual SICI 2014, organised by Nispana with its remarkable inventory of 24 speakers, construed into a successful platform for deliberation on the subject of sustainability. A professional business information company headquartered in Bengaluru (with an international office in Dubai), Nispana caters to providing 'A true B2B platform to the world's business leaders' in sectors of Construction, Energy and Power, Environment, Security etc. With a history of successful previous editions, the present edition of SICI was organised in Bengaluru on 7th and 8th August 2014 at Ritz Carlton, the global hospitality chain's sole presence in the country. The conference didn't merely prove to be an authority on the topic, but also touched upon the various nuances of the subject, apart from the many invigorating and candid discussions that took place between the speakers as well as the niche audience of 130 spectators. It made an equal attempt in serving as an important dais for some essential networking and collaborations. While everyone agreed to the term 'sustainability', there seemed an evident disparity in accepting the term 'Green' or the importance of the rating systems associated with it. The Chairman of the event - Mr M Selvarasu, Director, LEED Accredited Professional and Faculty, USGBC and IGBC, in his welcome address expressed his concern about the green buildings concept in India that has been blossoming, yet has been unable to reach the stage which was envisaged for it ten years back. Holding the Indian resources (or lack of it) responsible for the same he strongly stated, "We can't keep green as a business, we have to think from the heart". The Chief Guest for the conference, Shri S Sampathraman, President, Federation of Karnataka Chambers of Commerce and Industry (FKCCI) while dwelling on FKCCI's vision of sustainability of 'creating and rediscovering sustainable cities' suggested a stronger focus on the process of urbanisation in the future. He rightly said, "We come to this world and go away empty-handed. It is our responsibility to cause least degradation to the environment and if at all, better it." A very profound effort was evident in the selection of themes and their corresponding speakers which included industry-veterans, decision-makers and solution-providers. The speakers from the Architectural Fraternity were represented by Professor Krishnarao Jaisim (Founder, Jaisim-Fountainhead, Bengaluru), Architect Karan Grover (Founder, Karan Grover and Associates,Vadodara), Architect Brinda Somaya (Principal Architect and Managing Director, Somaya and Kalappa Consultants, Mumbai), Architect Rohit Saxena (Principal, Perkins Eastman, Mumbai), Architect Nejeeb Khan (Founder and Managing Director, KGD, Bengaluru), Architect Diwakar Chintala (Design Director, Gensler, Bengaluru), Architects Ashok and Meghana Dutta (Co-founders and Partners, Studio Decode, Bengaluru), Architect Paromita Roy (Deputy Director (Arch), UTTIPEC, Delhi Development Authority), Architect Nilabh Nagar (Senior Associate, Architect Hafeez Contractor, Mumbai) and Landscape Architect Prabu Manivannan (Founder, K C Design Studio, Tamil Nadu). Krishnarao Jaisim's hard hitting and honest admission of negating 'green rating systems', also led him to urge everyone to understand the 'parameters of being green'. He did invite a few disapprovals when he said, "Cities as they are cannot exist, and hence should not sustain'. Further, he advocated the need to not include the Government or bureaucracy in the sustainable/green movement. Karan Grover's non-agreement to Professor Jaisim's notions about green ratings were supported by his own acceptance that the rating systems had been created to encourage sustainable architecture. Architect Grover's interactive, motivating and stirring presentation with a lot of anecdotes focussed on the' tangible and immeasurable in sustainability and buildings'. While presenting some remarkable global work and views of architects on sustainability and green buildings, he also listed out his own dictums in design, reflected in his projects. Brinda Somaya while leading everyone onto a journey of some of her projects in different perspectives (villages, towns and cities), successfully exemplified an approach to architecture that was created entirely for the user's needs and desires while being extremely sustainable. She termed sustainable architecture as 'Ancient Traditional Knowledge' for which the dictum of 'Treading the land lightly' was a prerequisite. She emphatically added, "We citizens are the authors of the place we stay in and it is important for us to demand things". Rohit Saxena while conversing on 'Smart Sustainability' travelled back into history and demonstrated some mesmerizing examples and basics of sustainability, stating that the easiest way to approach sustainability was to consume less, build less, use it more and build for change and durability. He also shared some of his firm's ongoing projects where a different perspective in design was able to generate huge positive changes in the liveability patterns of its inhabitants. Nejeeb Khan, in his talk on 'Smart economy and Smart collaborations' spoke about 'what a city should be' and shared his worry of noticing how unhappy people in Bengaluru were. He replicated Dr Abdul Kalam's fascinating presentation 'Of a world in 2070'. He further showcased some of his firm's projects and proposals to the Government to better parts of Bengaluru, and added that to make the city smarter - smart media, smart grid, smart power grid, construction technology and renewable energy (as the main energy) were needed. Diwakar Chintala labelled the entire movement around green buildings as very 'melodramatic' and reasoned out that the two terms important in sustainability were 'Future' and 'Resources' and hence there was no need to complicate 'sustainability'. He showcased some designs of basic objects (like a Lunch Box) validating the fact that the basic aim of Design is to solve problems. Comparing the typical suburban communities in US to the chaotic slums in India, he said that the latter was always a preference; hence bringing to everyone's notice that the solutions were right within us and there was no need to import them. PANEL DISCUSSION: Bengaluru - Paradise Lost and an attempt to achieve a better future. Architect Jaisim and Dr Chandrashekar Hariharan recalled many moments of the nostalgic Bangalore that they grew up in and remembered how the city had moved on. Dr Hariharan added that probably the onus of the poor state of the city today has to be on the people (and he candidly included himself and Prof Jaisim in those people!) who failed to take the right decisions at that point of time when the city was digressing from its original character. Ashok and Meghana Dutta, representing a young architectural design firm with a green and technology-centric initiative received a thumbs-up for their design of an ideal net zero building - The Puma Retail Store (the brand's first sustainable flagship store) in a dense urban site in Bengaluru. They also elaborated and shared their innovative technologies in going green which included techniques like layering (double walls), earth air tunnels, wells for transferring light and air. Paromita Roy in her comprehensible presentation presented the Government's point of view on sustainable buildings highlighting the 'growth vision of Delhi' which is to make it India's first smart city. Elaborating on the Urban Budget Agenda 2014, she also talked on some of the pilot projects of UTTIPEC like the South Delhi Greenway Eco Mobility Corridor, Multi-modal transit centres and the principles of the upcoming policy of Transit Oriented Development Norms, developed for reduced vehicular travel and reduced pollution. Prabu Manivannan discussed the role of landscape in creating a sustainable environment through a factory project at Coimbatore and emphasized on its benefits. The conference also brought an amalgamation of green experts and consultants associated with renowned sustainability/green organisations in the country. Mr Gopal Krishnan, Director, Asia-Pacific and Middle East Region, USGBC deliberated on the Future of Green Buildings in India, acknowledging LEED as the next big thing to happen in the country, with building owners and tenants understanding the benefits of a green building. He explained the concept of the LEED Dynamic Plaque - a public declaration of a building's environmental efforts represented in the building's lobby, which allows the users to key in their feedbacks about the building. M Selvarasu, the Chairman of the conference dwelled on the 'Cost of Green Buildings', concurrently admitting that presently there was no clue in the country about fixing the cost of such buildings. Keeping the focus on incremental and operational costs and explaining the parameters for fixing this cost, he expressed that optimisation of cost is possible even with glass, air conditioning, high technology. His statement that 'We have to be innovators and trendsetters, and not followers' found acknowledgment. He felt that designers should be accountable for their projects and the operation team that steps in post the designer's exit, should be made a part of the design team. Chandrashekar Hariharan, Co-Chairman IGBC Bangalore Chapter and Executive Chairman, BCIL (ZED Group), shared what a true economist like him would do - the numbers of Indian economy, which according to him 'tell stories'. He highlighted examples of 'luxury in less cost' through some sustainable products offered by the ZED Group that is involved in providing green solutions for housing and other buildings. He recommended non-dependence on the Government or City Municipalities for waste, water and sewage and optimistically concluded saying, "In reality, this is the best period in world's history and infact, the best is yet to be." 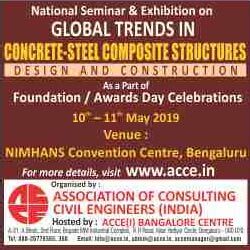 Mr C G Krishnan, Director, LEAD Consultancy - a Bengaluru headquartered design consultancy services in the sphere of green building designs, dwelled on the MEP challenges in the industry and gave a frame of reference for the focus as well as available opportunities for developers, architects, PMCs, Corporates, End-Users and MEP Design professionals. PANEL DISCUSSION: Preferential Tone of Green Spaces while environmental clearances are still not responding. Mr Selvarasu evoking his personal experience stated that the label of a green building pushes the government to work on it and give clearances in fast track mode. Mr Tapan Mozumdar, speaking for ITC and Infosys commented that since the two firms build for themselves, there has never been any Government involvement. He openly admitted that sustainability can be possible only when it makes economic sense. Mr Rohan Parikh also agreed that there was no need of Government intermediation to build green, only if one wanted change in the country, would there be a need for some mandate? Rohan Parikh, Head Infrastructure and Green Initiatives, Infosys in a very significant and motivating talk threw light on the Sustainability and the CSR Initiatives undertaken by Infosys. He proudly admitted that the company was able to achieve a 50% energy reduction in a time period of three years and discussed the company's mandate of keeping 90% of occupied space, day lit and without glare. He advocated the need to challenge the norm of everything that one uses, to innovate, take risks, support new ideas and technology. Tapan Mozumdar, Divisional Manager - Central Projects, ITC Limited, offered a corporate view of a sustainable building and termed sustainability as 'the capacity to endure'. Informing everyone about ITC's emphasis on structural, functional and aesthetic sustainability, he elaborated on some of the works of ITC including ITC Centre in Gurgaon (the first platinum building in India), ITC Luxury Hotels and ITC's Pilot Township in India. Rakesh Bhatia, Vice President (MEP& Sustainability Services), Ecofirst Services Pvt Ltd presented a case study of the 100 year old building of Bombay House - the head office of Tata Group in Mumbai- a consummate example of an existing building going in for green certification. While the building becomes the first IGBC Gold-rated building of the year, efforts are being made for it to achieve a Platinum rating. The presentation of DS Manohar, Director-Engineering, RSP Design Consultants, Bengaluru on sustainable approach in HVAC Design mentioned the evolution of air-conditioning, energy conservation measures, Building envelope parameters for going sustainable and the need to constantly innovate. A special applause also needs to be reserved for the organisers for integrating the presentations of the sponsors in an approach that was in direct sync with the theme of the conference. With senior executives representing their firms who spoke on sustainability with reference to their product types, this approach not only honoured the service-providers, but proved to be a lot of value-addition to the theme of the conference too. Srinivas Chebbi, Vice President - India and SAARC, Schneider Electric, Global Management Energy Specialists shared his views on 'Making Smart and Individual buildings a reality' and maintained that it was essential to be responsible in the way we use, build and run our systems. Besides directing everyone's attention on the need of a complete integrated solution to combat energy consumption, he introduced the CSR Initiatives of Schneider (aimed at training electricians and motivating 400 school children to become green ambassadors). PANEL DISCUSSION: Stakeholders Engagement to sustain green buildings operation for the entire life of the building. While Mr Rakesh Bhatia expressed the importance of finding out the end-user who would take the green programme forward and the need to make him part of this entire process of building green, Mr Srirangarajan Kadaba, General Manager, Schneider Electric labelled measurement data as extremely important and mentioned that green consultants should be involved in the day-to-day operations of the building and not merely in the design operation. Architect Paromita Roy suggested the option of looking at incentives for end-users. Anand Krishnamurthy, Marketing Leader, GE Water and Process Technologies highlighted the urban wastewater scenario of the country and its challenges in the different sectors, the concept of wastewater reuse and sewage treatment technologies. Harinarayan KV, CEO - South Asia, Lighting Technologies, explaining Modern energy efficient lighting technologies spoke on organic (daylight) and inorganic (artificial) light, new technology of organic LEDs and further opined that technology needs to be affordable. Krishna Srivastava, Director, Zuari Cement shared many innovations and implementations in concrete. Shailesh Khamar, Country Head, Viega focussed on the importance of water conservation and Viega's commitment to do so, and shared the products for pre wall technology, piping and drainage and requested the stakeholders to avoid cutting plumbing costs in construction. Mohan Kumar, National Specification Manager, Fosroc, a company dealing with durable and sustainable water proofing solutions shared some of the company's green products (Proofex Engage, Polyurea System). Chennai-based Straton Group, a company dealing in graded quality products and services available in the interior industry, was also a sponsor. A number of Panel discussions between the scholarly speakers gave much food for thought to the audience. The conference proved to be successful in its endeavour in breaking, creating and spreading new awareness in sustainability and green construction. As Mr M Selvarasu rightly concluded, that the one thing to carry back was COMMON SENSE which was an inherent part of every sustainable and green construction. The efforts of NISPANA for having maintained the passion to spread sustainability, was also applauded.